What a month June has been, busy, busy, busy! We have been trying to dodge the rain and showers to make some silage for the cows winter fodder and conducting tours for WWT in between. We are about a month late with our harvest and the feed value of the crop slowly drops as the days go past, while the crop continues to bulk up. The lower feeding value needs to be reviewed as the winter goes along to make sure we are not under feeding our cows nutritionally while still “filling their tums” with the bulk. Our cows are still milking during the winter suckling their calves, so the nutrition needs to be correct or health problems start manifesting themselves. 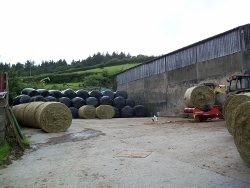 We work a family system with silage with Miles cutting and big baling, anyone who’s spare turns and strolls the grass, our son helps out bringing the bales in and Gail wraps the bales in the black cling film leaving Miles to stack then in our clamp ready for winter use. Intense long days but we are steadily winning against the weather! What a lot of walks! Other groups included a scout group, some of them using what they learnt towards scout badges, a French group ‘Transition France’ interested in our sustainability and an interest group from Bovey Tracey who questioned us about, hydro power, sustainability re energy, Dartmoor Ponies etc, conservation, farming and many other things. All the walks were engaging for us and judging by their comments for them too.